Kadhi is my most favourite comfort food. It’s one dish that my mom always makes, whenever I am visiting :). As I had mentioned in my last kadhi recipe, it is prepared in many different ways across the country. When I first visited rural Gujarat on work, I wasn’t very keen on trying the thali as Gujarati food is sweet and normally I’m not used to sweetness in savoury dishes. 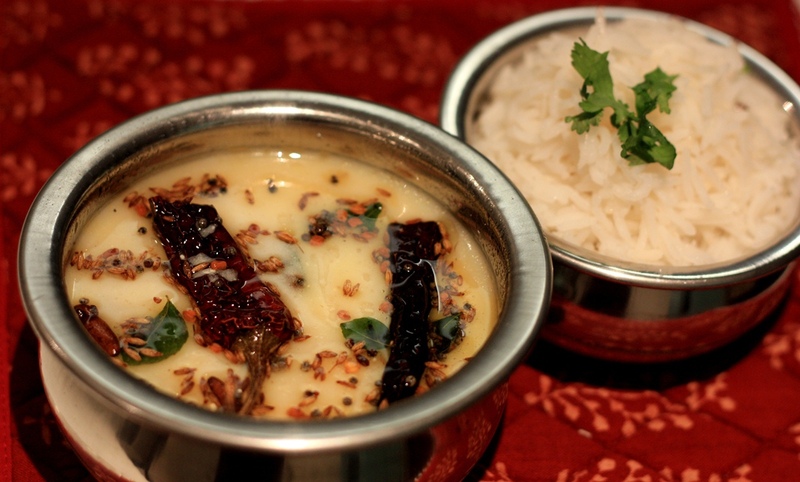 But just one try and I fell in love with the Gujarati kadhi. Traditionally it is served with khichdi or steamed rice but it’s great as a soup as well! The kadhi tastes best when made with sour yoghurt. To make your yoghurt sour, keep it out of fridge for a couple of hours. Whisk together yoghurt, gram flour and 4 cups of water to make a smooth paste. Add the chopped green chillies and jiggery. Mix well. Cook the yoghurt mixture on low-medium heat, stirring continuously until the yoghurt boils. After that reduce the heat to low and let the kadhi cook until it attains a moderately thick consistency. Stir occasionally. Note: Remember not to boil the kadhi on high flame as it tends to curdle. For tempering, heat oil in a small pan (preferably a tadka pan). Add the fenugreek, cumin and mustard seeds, curry leaves, red chillies, cloves, cinnamon and asafoetida. When the seeds begin to sputter, pour the tempering (tadka) into the kadhi and mix well. Serve hot with rice or khichdi or have as is as soup. 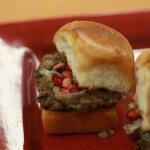 Dabeli: sweet and spicy and crunchy! A must-eat Gujarati street food! 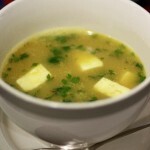 lentil & cheese soup: something warm for the cold evening!